This classic coffee cake owes its extra-moist texture to the sour cream in the batter, while the topping makes a crunchy top layer. This coffee cake would be a lovely addition to a brunch buffet or served as a sweet foil to a savory dish. This would also complement a fresh fruit salad, maybe with a hint of mint. I have always loved a good coffee cake, there is nothing better paired with my black coffee in the morning. It’s not bad with hot tea either. With the cold, rainy weather we have here in Oregon, this is the perfect morning pick-me-up. Also, there is no mixer required to make this, so it’s just that much easier to throw together. In a large bowl, whisk together the flour, granulated sugar, baking powder and salt. In a medium bowl, whisk the egg just until the yolk and white are blended. Add the sour cream, milk and melted butter and mix well. 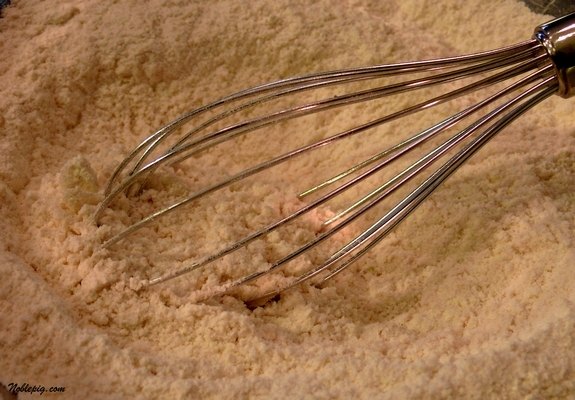 Pour the egg mixture into the flour mixture and stir just until the ingredients are blended. Stir in the chopped apple. Spread the batter in a buttered 8 x 8 square baking pan. 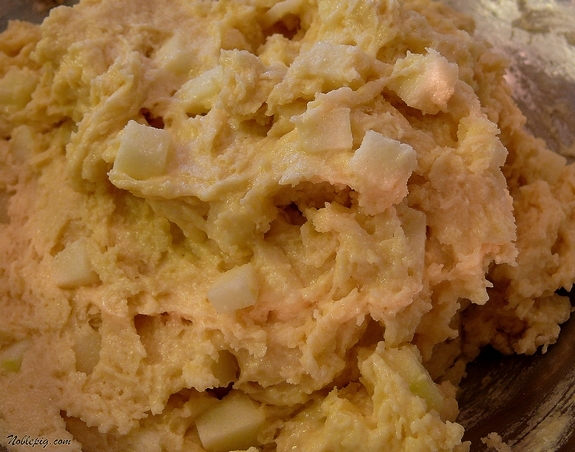 To make the topping, in a bowl, combine the brown sugar, flour and butter. Using your fingertips, work the ingredients together until a coarse, crumbly mixture forms. Add the walnuts and mix well with your fingertips. Sprinkle the topping over the batter. Bake the coffee cake at 400 degrees for 25-30 minutes until the topping is browned and a sharp knife inserted into the center comes out clean. 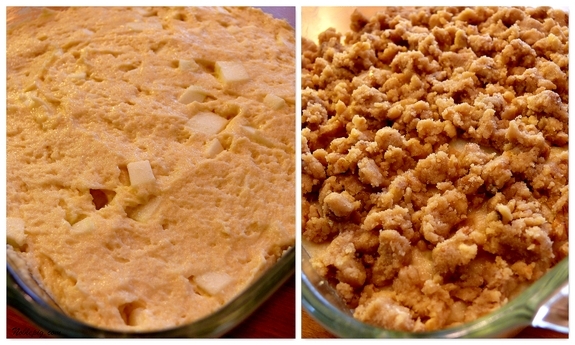 Let cool for about 5 minutes, then cut into squares and serve warm or at room temperature. I might have eaten a few too many pieces of this. Bake the coffee cake at 400 degrees F for 25-30 minutes until the topping is browned and a sharp knife inserted into the center comes out clean. Let cool for about 5 minutes, then cut into squares and serve warm or at room temperature. I have been looking for a coffeecake recipe and after seeing this I believe I need to look no further! Looks delicious and I am making this SOON! Just a short comment to say”wow”. I am leaving my desk now to go and bake this!!!! Any cake with sour cream in it has my vote!! I’ll have to try apples in mine some time. I have been seriously craving a coffe cake lately. It brings back memories of when I was little at my aunt’s house. She seemed to have a never ending stream of them. I love the sound of the simplicity and ease of this gorgeous coffee cake. Perfect! WOW this one really looks like it is simple but delicious. I think I could make this one and my hubby would love it for breakfast. Sweet breakfasts are his favorites. Your photo really shows the texture to be super moist. YUM. Sitting here drinking my coffee, I feel suddenly unfulfilled. Your coffee cake looks great! …smells like Christmas morning to me! I love apple coffee cake. This recipe looks so good! Wowzers! I can smell this lovely baking right now. This looks fantastic! Such wonderful flavours =D. How I wish i were having this for breakfast, it sounds so good! what an excellent crumb, and i always find a slightly crunchy topping appealing. three cheers for sour cream and brown sugar! yes a crunchy top you say? oh heavens yes. and the smell coming from the oven, and then the long wait for it to cool a bit before diving in. Oh dear, what a sinful temptation your blog is for me…but I just can’t stay away, especially with a winner like this…with a sick youngster in the house and off all week to be with him, I might have to try this one out….THANKS! Ooh, love the crispy top! Love a good coffee cake! I’m all for brown sugar! And I’m also for moist cakes with cruchy toppings! Oh yes!!! I would like a piece of that right now! It looks just like the one my grandmother used to make. I love coffee cake, but don’t think to make it very often. Just an update: I made this recipe this morning, but substituted fat free yogurt for the sour cream, and skipped the walnuts. It was DELICIOUS! 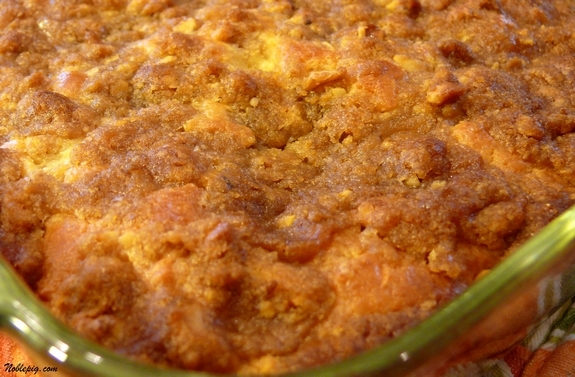 The cake is moist and tender, and the crumb topping was melty and gooey but still crumbly. Wonderful! I did add 1/2 tsp cinnamon to the crumb mixture, and the smell was completely delightful. I think next time I might try it with some oatmeal in the crumb mixture as well. Thanks for the inspiration, Cathy! I LOVE coffee cake! This looks incredible. I moved to a different school in 7th grade – not remarkable since I had already been in many schools. What was remarkable to me was that they gave us a quarter of cooking class. The first thing I ever baked was a sour cream coffee cake, when I was 12, in 7th grade cooking class. I toted that recipe home and made it for years. Thanks for the memory! It is all about the sour cream. Makes the cake very moist! MMmmmm, love that streusel topping! In the morning, with a cup of coffee, is when I enjoy a sweet treat most. 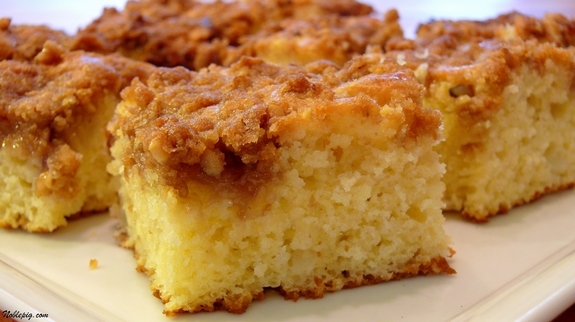 A coffee cake is always worth it for the crumb topping. I love the addition of the apples. This coffee cake looks awesome! The pictures make me want to have this RIGHT NOW! My grandma makes a killer coffee cake but I think I’ll try this one and see whose is better…I may be disowned!! Mmmm that looks, as my 4 YO would say, SCRRRRRRRUMPPPP-TIOUS!! I have got the coffee brewing. You bring the cake!! Cathy, this looks & sounds sooooo good! I think the best time for me to try this is when the kids are home at Christmas. They will love it! Thanks! That looks so good… I don’t typically like most cake… but I do like most coffee cakes! This looks really good. I’m bookmarking this one. This sounds so good with the apple and sour cream! And, you can’t go wrong with a crumb topping like that. Made it this morning, absolutely fantastic and moist and tasty…thank you! That looks delicious! And with apple, too! I’ve gotta copy this one down!!! 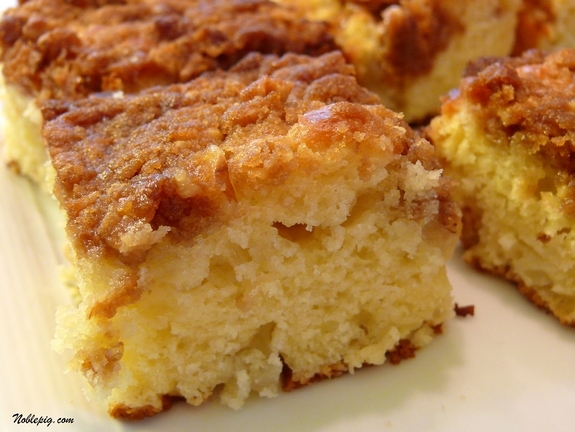 Cathy, sour cream is a great addition to any coffeecake but your topping brought me to my knees. I love the hint of butterscotch it imparts to the cake. Good thing it’s late here, otherwise this would be in the oven. Looks wonderful! You make that cake look so easy! I love the topping. Stop posting these amazing baking recipes already! You are turning me into a midnight baker! I posted your crack bars (I mean apple spice bars) on my blog tomorrow. I love coffee cake like this one, especially when the top has a bit of crispness to it and the bottom is moist. Yum. I so wish I was going to eat that for breakfast tomorrow. It looks amazing. Lucky me! I’m having the girls over for coffee this Saturday!! Just the recipe I was looking for!! whoohoo! So yum! My mom used to buy us those Entenmann’s coffee cakes for special occasion breakfasts… yours looks about 20 times better! DELICIOUS! Sour cream always makes a cake so moist. I adore the topping. Wish I could have it with my cup of coffee right now! You make the most wonderful recipes. Another instant classic. Brown sugar is king! How do you make all these delicious treats and keep your figure? YUM YUM YUM!! What a wonderful recipe for when the girls come on over for breakfast chat time!! AKA business strategy sessions!! i was just thinking how i’d like to make a coffee cake this weekend! i might try this one! This sounds really good. Wish I had some this morning. Seriously … I can smell the yumminess!!! Your blog always makes me so happy! I’m a sucker for anything brown sugar. Your cake looks so delicious. I am going to make this! Yum! I made this but i put cinnamon in the topping, its been in the oven for 20 minutes and OMG my house smells amazing! I can’t wait to taste it! Planning a big weekend brunch and stumbled across you blog while googling recipes. You are full of great ideas. I think I’ll give this coffee cake a try. Do you think doubling the recipe and baking it in a bundt pan would work out? I think I’ll put the crumb topping ini the middle, the way I did in my youth with a packaged bundt cake mix.